Newcomers to the valley may think that cities have been in place forever. That is far from true in the San Ramon Valley. Three new cities were created when Dublin voters approved citihood in December 1981, Danville in June 1982 and San Ramon in March 1983. There were many efforts to incorporate cities before the eighties. After World War II the valley population began to explode and change was in the air. There were no sewer pipes, inadequate water supplies and deficient road capacity. Since the valley was under County control, development plans were made by the County Supervisors. Gradually organizations formed to respond to the growth and worked to influence county planning decisions. The Alamo Improvement Association (AIA) organized in 1955, San Ramon Valley Chamber of Commerce planning committees reviewed development proposals, and other homeowners associations in San Ramon and Danville sprang up. Arguments for and against incorporation were similar in six unsuccessful attempts from 1956 to 1976. Proponents thought that taxes generated in the valley were being spent by the County elsewhere and wanted local people to make development decisions. They called for more parks, better recreation programs for youth, and a larger police force. Opponents were certain taxes would go up, feared a loss of community identity, and worried about unknown leaders. They were generally happy with the status quo. The first efforts took place in 1956 and 1961 and were initiated by the Alamo Improvement Association. The AIA was concerned that Walnut Creek might annex parts of Alamo and unhappy over several County decisions. An AIA study in 1956 examined what income a potential city would have and discussed levels of government services, then decided not to organize and put incorporation on the ballot. In 1961 the Committee for Self Government gathered signatures to give Alamo voters an opportunity to vote for or against a new city. Owners of 51% of the assessed valuation (AV) were needed to approve such an election. Round Hill County Club had just begun and, since the owners still needed more county approvals, they did not want to gamble on a new city council and opposed the vote. Emotion was high as arguments pro and con were featured in the Valley Pioneer. This effort never came to the ballot because the opponents went to the assessor’s office and copied the proponents’ signature list and, “with evangelistic ferver” according to Eleanor Rusley, persuaded many of the original 70% who had signed to withdraw their support. The Committee did not realize this was happening until it was too late. The opposition group was able to present a successful petition against the election by 51% AV. 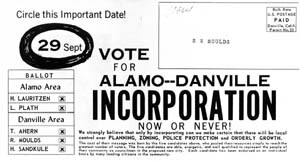 On September 29, 1964, an effort to incorporate Alamo and Danville went to the voters. It fell 119 votes short, by 2086-1958. The AIA and a newly formed Danville Homeowners Association initiated the incorporation study and organized as the Good Government Committee. Opposition came from the development community which was uneasy about who might be approving their proposals; they formed the Committee Against Incorporation. Had the measure passed, the city council would have been T. J. Ahern, Herman Sandkuhle, Max Lauritzen, Richard Moulds and John Hartwell. While the Chamber of Commerce and all homeowners’ groups actively supported this effort, businessman George Filice led a group called Valley Homeowners Against Incorporation. The effort lost by a vote of 2796 to1830. Again the status quo prevailed. This council would have included: Roy Anderson, Byron Athan, Francis Driscoll, George Filice and John May. Interestingly, both Athan and Filice ran for the council but opposed incorporation. In part II , more efforts at home rule.